Stocks were soaring Friday after the release of a strong US jobs report. US equities extended their gains after Federal Reserve Chairman Jerome Powell indicated the central bank would pay attention to the market’s concerns. Earlier Friday, the US and China announced they would meet Monday in Beijing to work toward a trade deal. Apple shares bounced back a bit after Thursday’s steep slide. 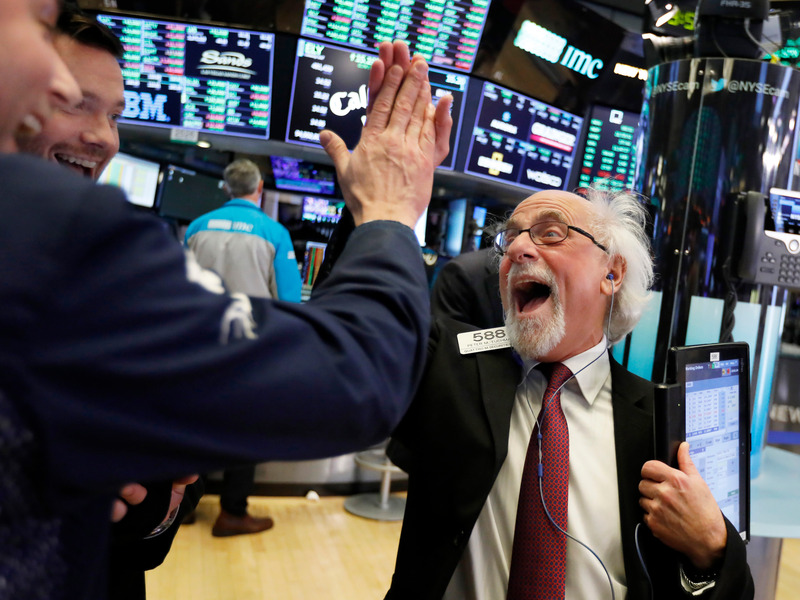 Stocks were soaring Friday after a blockbuster jobs report and comments from Federal Reserve Chairman Jerome Powell sent traders scrambling back into US equities. The Dow Jones Industrial Average was up 800 points, or 3.5%, as shares bounced back following Thursday’s steep slide. The S&P 500 and the Nasdaq Composite were higher by 3.6% and 4.5%. US equities got an overnight boost after the US and China agreed to meet Monday and Tuesday in Beijing to work toward a trade deal. Those gains carried over into Friday morning’s December US jobs report. The Labor Department said the US economy added 312,000 nonfarm jobs and the unemployment rate jumped to 3.9%. Average hourly earnings climbed 0.4% last month and at a 3.2% annual rate for their best gains since 2009. “We expect the December employment report to remind markets that the US growth outlook remains stable despite financial market volatility,” said Lewis Alexander, an analyst at Nomura. Stocks continued to build momentum early in the US session after Powell indicated the central bank would take into account the market’s concerns. All 30 Dow components were trading higher, with Intel (+6.3%) leading the way. Apple (+4.2%) bounced back after a sales warning out late Wednesday sent shares cratering by 10% on Thursday. Elsewhere, the industrial giants Caterpillar (+5.4%) and Boeing (+5.1%) rebounded on signs the US economy may not be slowing down as feared. Aside from the strong jobs report, the December reading of Markit US Services PMI printed 54.4, topping the 53.4 that was expected by analysts surveyed by Bloomberg. Treasury yields soared on the positive news, with the benchmark 10-year yield up 11 basis points at 2.66%. Earlier, it had touched a near one-year low of 2.54%. The US dollar index rallied to a high of 96.60 following the strong jobs number but plunged back to the flat line near 96.30 after Powell began to speak. On the commodities front, West Texas Intermediate crude oil spiked 2.3% to near $48 a barrel.